IT’S A BIRTHDAY STAMP SALE! To celebrate Stampin’ Up!’s 30th Birthday they are having a 15% off sale ONLY FOR 24 HOURS. There are so many to mention. You WILL want to check it out. You will be able to view the full list with images tomorrow (Tuesday) on my website. Check in ->HERE then. Here is a taste of some of the sets. **(Please order by 9pm so I can finalise all the orders in time). Email/Phone me directly with your orders. ACCENTED BLOOMS IN BASIC GRAY! I have been sharing cards with you with the Accented Blooms set. I had a Craft Show over the weekend and I focused on this set for the Make and Take there. When I was thinking of using this set for the show it needed to be a simple card that didn’t require colouring with it as there was no time for that in the small minute that you have with people. I came across a card by Amanda Bates with some simple stamping in Basic Gray and a POP of the Lemon Lime Twist. So I CASED her card for it. (Thanks Amanda 🙂 ) You can see her card -> HERE. This is the card that everyone made. I have to say that Kids and adults loved making this card. It’s just a mini card 10cm x 10cm. (4″x4″). Stamping in Basic Gray gives a little more softness to it than using a heavy black. I liked the Lemon Lime Twist POP. Everyone added a Rhinestone to their card for a little bling rather than the Glitter Gems that I have added on this one. I have another card with this set that I will share with you shortly that doesn’t require colouring. Check in soon for that. LAST DAY TO GO IN THE DRAW TO WIN A STAMPARATUS! 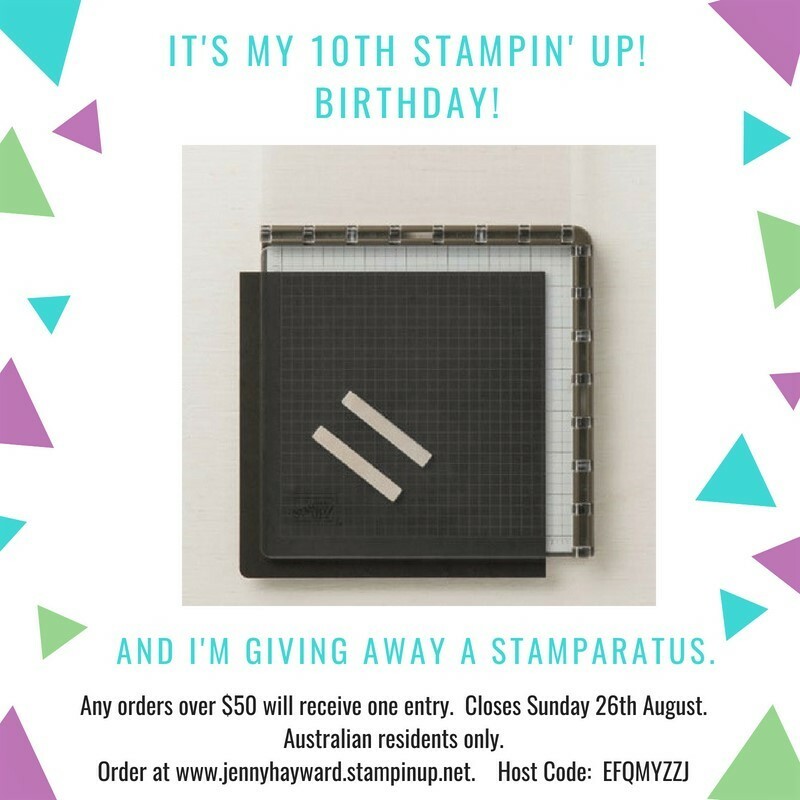 I am giving a Stamparatus away this week to celebrate my 10th Stampin’ Up Birthday. Entries close tomorrow (Sunday) so you better get on to it. Here are the details to remind you. The Stamparatus is a great positioning tool that will help you in your stamping. I am really excited to be able to give one lucky person the chance to have their very own one. Every order over $50 will receive one entry. Orders can be emailed/phoned directly to me or can be submitted through my store. (see below). Australian residents only. Orders must be received by 8pm Sunday 26th August. EVERY ORDER WILL RECEIVE A SMALL GIFT TO SAY THANK YOU. Don’t forget with Bonus Days on too, for every $90 order you will receive a $9 redemption voucher to use in September. BLENDED SEASONS AND BONUS DAYS! August is an exciting month with some awesome happenings. Let me tell you about them. The Blended Season Bundle is a limited release bundle. It has some gorgeous stamp images and sentiments for many occasions. The matching Stitched Season Framelits you will love. They leave a stitched edge on the inside and outside of your diecut. Use them in many ways. If you love the Stitched Shapes and the Stitched Labels Framelits, these are a must have. If you want to order any of these you need to be quick. They are only WHILE SUPPLIES LAST. I don’t want you to be disappointed so get in early. (To order see below). What a “bonus” that Bonus Days are on this month when the gorgeous Blended Season is available. For every $90 in orders during August you get to earn a $9 voucher to redeem in September. How cool is that. NB: After your order is placed you will receive an email with a code. You must keep that email with the code so you can use that for your redemption in September. You can earn as many Bonus Days vouchers as you like. Blog Hops, cards, Catalogues, Stampin' Up! JOY OF SETS 2018 CATALOGUE BLOG HOP! I am taking part in a Blog Hop today with the Facebook group – The Joy Of Sets. You might have just come from Kirsten’s blog. (click on the arrow below to go back if you missed it or you will get there after going around the hop). Today’s theme is a project using any product from the current 2018 Stampin’ Up! Catalogue. Focusing on ANY product from this current catalogue is pretty overwhelming really. There are so many wonderful products. What do you choose!! After trying a few options I chose the Sitting Pretty Bundle. I made a card set in some fun bright colours. I used the Brights Paper stack and the co-ordinating Glitter Enamel Dots in Gorgeous Grape, Granny Apple Green, Coastal Cabana and Melon Mambo. The lovely ornate seat is heat embossed in Copper and then cut with the Pretty Park Framelits. I added a vellum scallop circle under the seats and cut a small heart that is in the Framelits set in the matching colour. The sentiments and the fun swirl is from the Happy Birthday Gorgeous set. Here is a close-up of the Gorgeous Grape one so you can see it more clearer. They are all the same layout. Now you can continue the Blog Hop and see all the other creations. Head to Susan’s Blog by clicking on the arrow below. TEAM SHOEBOX SWAP – DAY 4! OK, Today is my last sharing from our recent Team stamp day with Shoebox Swap cards. I have a few various ones for you. This one below is using that gorgeous Delightfully Detailed Laser Cut paper. I have shown lots of cards using this paper recently. For this card you don’t need much more than backing a section of the paper on to a strip of black card and adhering it to your white base card. It makes it look so elegant don’t you think?? I think from memory the sentiment banner is a strip of white card and using the small circle punch to notch out each corner. This next one is a fun fold. Adhere a strip of the lovely paper, this one is the Nature’s Poem DSP, down the left hand side of the front of your card. Punch a slit using the Classic Label Punch on the side of the card front. You need to punch it twice to be sure that the dragonfly fits through. Punch it once near the top, then slide it down a little bit and line it up with the previous punch and punch it again. A dragonfly from the Detailed Dragonfly Thinlits was cut from Vellum and also from Cajun Craze. This is the inside of the card. The sentiments are from Better Together set. It’s a cool card. This card uses the lovely Love What You Do set, the Share What You Love paper and the Lovely Floral Embossing Folder. This is a cute little treat bag below. It is very quick to make up. This is based on Pootles bag -> HERE. Hope your weekend is going awesomely. Quite a few weeks back I mentioned a team stamp day I went to and we had a Shoebox swap. I said I would share the cards we made. It has taken some time to get back to them with lots of other exciting things happening. Over the next few days though I will share them with you. Firstly, if you are not sure what a Shoebox swap is: Each person makes a card and then makes up kits for that card for the number of people that will be there at the event. We had 13 people come along for that team day. I have already shared my card I made for it some weeks ago. You can see that card -> HERE. The Animal Outing set was a popular stamp set to use for that day. I will show you these cards today. I won’t give you specific details on the cards. I think for the most part they are straight forward. All the Rhinos were coloured with the Blender Pen which I don’t normally use to colour. The curvy pieces of card sticking from under this card below is actually a piece of Grapefruit Grove card punched with the Daisy Punch. The Daisy is then cut and sections adhered under the stamped piece. The background on the Basic Gray card is stamped with one of the stamps from the Waterfront set I think it was. The background strip on the card below was stamped with the Waterfront stamp set too I think. The colours used for this was Mossy Meadow, Old Olive and Smoky Slate. I drew “dashed” lines with Black Marker on the stamped card piece with the Rhino to create a frame around him. This one below has a lot of different steps to it which I will explain below. The circles were stamped in versamark using the Stamparatus to position them and then heat embossed. I think there was a template to cut the circle from the white card (which was shimmery White card) to be sure it was in position. On the circle off-cut the little frog on a tree was stamped in black Stazon and coloured with the Watecolor Pencils I think. It was coloured after the next step though. The circle was sprinkled with Brushos Crystals and then misted with water. The corners were punched with the Detailed Trio punch. I will be back tomorrow with some other great projects from the team day. Stay tuned. 5 WAYS WITH PAPER – DAY 3! Today’s card #3 using your paper is such an easy card. This card was inspired by one some time ago by Barbstamps, even before Pinterest. I had it filed away for a while with lots of other ideas. I have used the Nature’s Poem Designer Series Paper. Take a piece slightly smaller than your card base. Cut it in half. Flip one side over and adhere the pieces on to your card base. Really it is that simple. You could cut it in 2/3 – 1/3. Position the card in landscape or portrait orientation. So many different ways. You get to see both sides of the gorgeous Stampin’ Up! patterns. Decorate your card as you like to. For this one I stamped the sentiment from Accented Blooms and punched it out with the Tailored Tag Punch. I punched a second label out from Cajun Craze card. Cut it in half across ways and adhered that behind the stamped one to show an edge top and bottom. Easy! I went a little wild with the Copper Thread. 🙂 Raise your sentiment off with Dimensionals and you are done. This makes a great masculine card even. Thanks for visiting. Stay tuned for tomorrow as I have another card for you. Don’t forget to #usethat paper you have around.